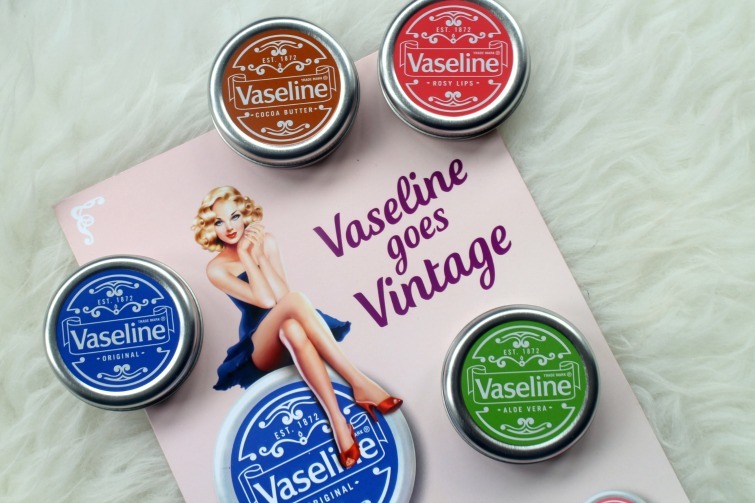 Early readers of my blog will know that it's roots lay in vintage hauls rather than the beauty variety so the recent special edition vintage style tins from Vaseline certainly caught my attention. Did you know that Vaseline has been around since 1872? Me either. I apologise in advance but I will likely be referencing Christmas a lot in the next couple of weeks and as I discussed in Friday's post these cute tins would certainly be a worthy addition to any Christmas stocking such as the one I usually receive filled with beauty treats and necessities. The line up includes the Original formula we all know and love, Aloe Vera, Cocoa Butter, which is my favourite fyi and finally Rosy Lips which has a slight tint for those at home no make up days. I know many people that would enjoy having one of these attractive tins sitting on their desk at work or bedside table. I for one have a lip balm next to my sofa so that I can lazily reach across for a swipe when my lips are verging on the drier side. They would also make a great unisex product for homemade crackers or table gifts for visiting friends and family and those of you with children the important gifts for teachers and the like. A quick look online and Boots have a 3 for 2 offer on so it's the perfect time to get ahead with your shopping. What do you think of the new style tins, are you a fan of the vintage style? I think they look great and they're a great size to carry around in your handbag. I like the sound of the rosy lips one.